NEW YORK (TheStreet) -- Energy Transfer Partners (ETP has agreed to acquire Susser Holdings Corporation (SUSS, whereby ETP will own general partner (GP) interest and incentive distribution rights (IDRs) in its unit Susser Petroleum (SUSP. After the transaction, ETP will hold around 11 million Susser Petroleum common units, or around 50.2% of currently outstanding shares. The cash and stock transaction for Susser Holdings will total around $1.8 billion. 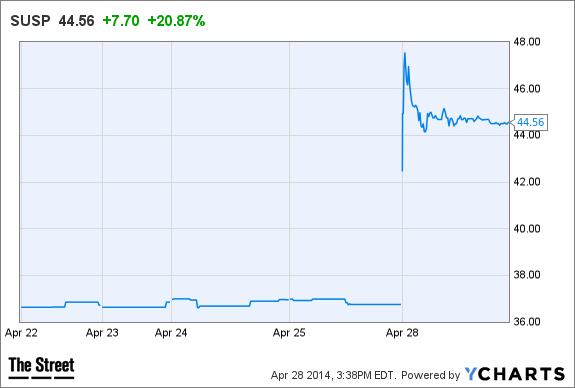 By late afternoon, shares had skyrocketed 20.9% to $44.57. Trading volume of 1 million shares was more than 21 times its three-month daily average.